Performance, management and TCO are also important factors in adopting private, hybrid and public clouds, respondents say. “The ability to move applications between different cloud environments easily and inexpensively enables IT teams to better manage their cloud costs while still balancing management, security, and performance requirements,” the report says. Simultaneously, the survey reveals that technical barriers limit application mobility across clouds, keeping enterprises from fully embracing the promised flexibility of hybrid cloud technologies. These challenges likely account for at least some of the disparity between 91% of respondents ranking hybrid cloud as the ideal IT model and today’s relatively low hybrid cloud penetration levels of just 18%. The companies surveyed for this report clearly indicated that their use of both private and public clouds would rise sharply during the next 12 to 24 months. At the same time, they indicated they would like to see improvements in application mobility and interoperability among cloud environments to allow greater flexibility in matching applications to the most appropriate infrastructure. CISOs cited security and a scarcity of hybrid cloud skillsets as additional barriers to achieving these goals. 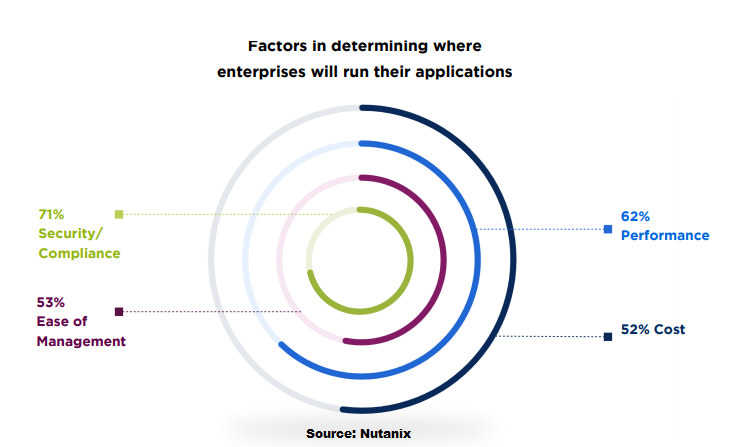 VansonBourne conducted research on behalf of Nutanix to gain insight from 2,300 IT decision makers into enterprise plans for adopting private, hybrid and public clouds. The respondent base spanned multiple industries, business sizes and geographies, which included the Americas, Europe, the Middle East, Africa and the Asia-Pacific region.